HMRC (Her Majesty’s Revenue and Customs) staff who are members of the PCS union took the first day of strike action against threats to jobs, privatising the work and slashing pay and conditions on Monday, 25th June 2012. They are asking that HMRC offices are resourced properly and for staff to be able to work in a stable and valued environment. While the Government, with at least 17 millionaires in Cabinet, is telling us all that there is no choice but to make massive public sector cuts, PCS members in HMRC know there is at least £120billion unpaid in tax by the super rich evading their responsibilities. 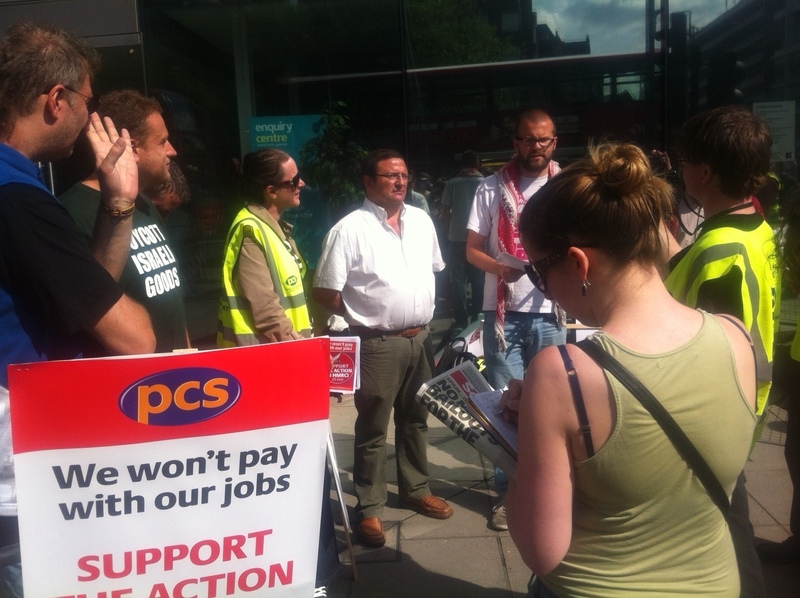 A Spanish miner – on a solidarity tour of the UK, PCS supporters from the IPS (Identity and Passport Service) and Camden UNISON addressed the picket. Speakers gave solidarity support for the strikers and condemned the hypocritical government stance condemning only Jimmy Carr for evading tax, and not others – when it is in fact many Tory donors and supporters who have been instrumental in inventing new ways to evade tax payments for the super rich!